UPDATE: It had come to light that the $5.5 billion that the government said or implied it would invest on core infrastructure isn’t really $5.5 billion. Minister Steve Ashton clarified that this figure includes anticipated cost sharing from the Feds. See here and here. How much are they going to spend? No one knows. Not even the government. Even once they get their next budget sorted out projects often get delayed, and as the opposition has pointed out, the administration has spent only about 75% of the money it has earmarked for infrastructure in previous budgets. Does this mean the government might really be on track to “probably” balance the budget by 2016? No. While the government may end up spending much less than $1.1 billion per year on core infrastructure, and while they’ve underspent on infrastructure in previous years, they have overspent on almost everything else. Year after year the NDP has spent more than budgeted overall. 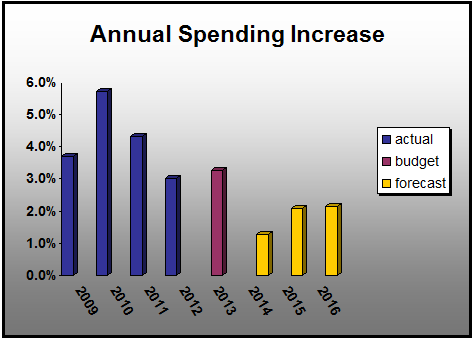 With a tough election battle brewing you can be sure that there will be no shortage of spending announcements in the next two years, so while actual infrastructure spending might be uncertain, you can be fairly certain that when those short yellow bars in the graph below turn into blue bars they will be much taller. When asked if the government was still on track to balance the budget by 2016/17 as planned, Manitoba Premier Greg Selinger said “probably”. Politicians tend to make bold and definitive statements, even when the truth is far less certain. The new waffling by Selinger on the balanced budget target is a sign that the balanced budget target will almost certainly not be met. This would be no surprise to anybody who has looked at provincial budgets, past and present. Was it ever realistic that they were going to balance the budget by 2016/17? Possible, yes, but realistic? According to the government’s projections, they would need to hold spending increases to an average of less than 2% over the next three budget years. To put this in perspective, the NDP under Doer & Selinger have averaged annual spending increases of 4.8% since they took office. Meeting their balanced budget target would have required unprecedented levels of fiscal restraint. Again, not impossible, but highly unlikely given that the NDP will be heading into its most challenging election battle right around the time that the books are supposed to be balanced. Unless the party was planning on completely reinventing itself from a spend-your-way-to-success party to restrictive fiscal police and running on cutting jobs and freezing union wages, they never really had any hope of achieving this goal. We can rule out that unlikely scenario with this last speech from the throne, which among other things committed the government to $5.5 billion in infrastructure spending over 5 years. That’s $1.1 billion per year, for those of you who never quite got the hang of math. Again, to put this in perspective: the total anticipated spending increases over the next 3 years in the balanced budget plan is $0.83 billion — less than the annual core infrastructure spending on it’s own. By now it should be apparent that the balanced budget target will not be met, so why is the Premier still saying that they are “probably” going to make it? Now, I do not like to call people liars. I take no pleasure in it, and I am not prepared to call Premier Selinger a liar just yet. There are other potential explanations that we need to explore before we make that leap. Explanation #1: The government will increase taxes to balance the budget. The Premier has ruled out a PST increase, but of course he ruled out the last PST increase as well before doing it, so who knows. There are also other types of tax they could increase including personal and corporate income taxes. Increased taxes = increased revenue = balanced budget. Explanation #2: Greg Selinger does in fact believe that they are more or less on track, but just has a really really poor grasp of numbers and accounting. I mean, really bad, as in he pays for his Teen Burger with a $100 bill and isn’t sure if he’s getting change back bad. I don’t think this is the case, but if true it would help explain the inconsistency between his words and the facts on the table. Explanation #3: Selinger is clinging desperately to the hope of a financial windfall sometime in the next three years. Perhaps the federal government will jack up transfer payments, or maybe North Dakota will die and leave Manitoba it’s inheritance. Explanation #4: This is the interactive portion of the blog where you the reader gets to submit a theory, because I’ve got nothing else. When you’ve exhausted all other plausible explanations the truth is usually what remains. In this case, the truth is “probably” that Selinger knows the books will not be balanced on time. Call it what you will. Anyone who believes or suggests otherwise is an idiot. It’s got to the point where there really isn’t any point of debating their policies or positions because the likelihood of them being false is almost 100%. I almost don’t even bother looking at their communications anymore – what’s the use? It’s all lies anyway. Majority of Peggers are to stupid to vote them out.Then again, what option do they have. Thank goodness for federal transfer payments or we’d be royally fcked. I think a lot of Peggers are getting tired of them and looking for an alternative. The Liberals might turn out to be that alternative. When all arguments to support a policy or a projection fail then it is time for the scumbuckets to deflect criticism by creating a diversion. so I was wondering what kind of diversion Selinger might have up his sleeve. As it would take the Federal government to declare a war, he probably can’t get away with that and besides he would not want to take on the US or probably even Saskatchewan. I know! He is going to announce the annexation of North western Ontario. He will offer lower price power and access to Ikea…..yes, yes looks like a winner. Poor Manitoba!